Way back in 2010, I created a theme (with your help!) that covered sleuths who are private investigators. After just discussing Lea Wait’s Mainely Needlepoint series (click here for that entry), I checked to see if I had remembered to include this series on that list. Yikes! I’m glad I checked! Hmmm… Finding that I had forgotten to include this series on the list, I wondered what other series/sleuths were missing from the list. What better time than now >>> to update that list! I think we should include sleuths who were former private investigators, also. In the Mainely Needlepoint series, the sleuth formerly worked for a private investigator, and she uses skills she learned as a private investigator to work on and solve the mysteries. So, here is the list of sleuths who are private investigators (as updated). Do you see any who are missing? Please leave a comment below so that I can add them to the list. Thank you! P.S. 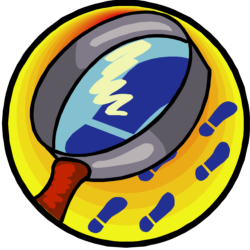 If you’d like to see lots and lots of themes, be sure to take a look at the Cozy Mysteries by Themes page on my site. Cathy, I try to add each new series that I post to its corresponding theme pages, but sometimes I forget. Thanks for the reminder. E.J. Copperman: Haunted Guesthouse Mystery. The Ghost Paul is a PI who can’t leave the house. Alison also got here PI license so she could investigate (unwillingly) for Paul. Sheila in CT, E.J. Copperman’s Haunted Guesthouse is perfect for this list. Thanks! V. I. Warshawski. V. I. is an ex-attorney, now a PI in Chicago. I’ve got this series on my TBR list. Sheila in CT, thanks, again! Anne Perry’s William Monk began as a private enquiry agent. I hope I remember some more. I don’t have many books on my shelves nowadays. How about Charles Finch’s Charles Lenox mysteries? I’ve been listening to audiobooks of this series–they’re very good. Yes, I’m partial to English accents :-). Marie, I just added Charles Finch and off to see who does the narration. Marie, I just listened to a sample on audible . com, and at first I thought it was Alan Davies – from Jonathan Creek fame. A narrator can make or break a book >>> and James Langton sounds like someone who would make it! MJ, this is yet another series that I missed when she started this series in 2013. Thank you! In the newer books of the Gaslight series Frank Malloy is now a PI. Not sure if you would list it here since this a recent career change for Frank but thought I would mention. Tracie, thank you. I’ve just added it to the list. I believe that Casey, the sleuth in Betty Hechtman’s Yarn Retreat Series, used to work for a PI and still calls him for occasional advice. Casey IS a dessert chef who runs the yarn retreats, but you said, “I think we should include sleuths who were former private investigators, also” and, as I recall, before Casey moved to Monterey, she worked for a PI and uses that experience to help her solve crimes. She calls her former boss/mentor to get his perspective on her current case. But I may be remembering that incorrectly or the situation may not fit your parameters. Ingrid, thanks for the clarification. I’ll go add her to the list. (I got it confused with Lea Wait’s Mainely Needlepoint series.) Thanks, again! And… I seem to remember that Carolyn Haines duo of Sarah Booth Delaney and her best friend, Tinkie Richmond, are now officially in the detective for hire business. Dragons3, I’ve added these to the list. Thanks. Elaine Viets. Her Dead End Job series sleuth eventually becomes a PI who still works at various jobs to help solve crimes. My apologies for not seeing Carolyn Haines and Elaine Viets on the list before I posted. Can I blame it on having a cataract ☺? Ingrid, I added both Elaine Viets and Carolyn Haines to the list after I read your comments. (Definitely no apologies needed!) Thanks! Rhys Bowen-Molly Murphy is the greatest PI. Lillie, thank you. I appreciate your help. Maggie Pill’s Sleuth Sisters are PIs in Michigan. Barb is a former assistant DA who retired and came home. She and her sisters, Faye and Rhetta, are the Sleuth Sisters. Each one narrates chapters so you see the entire investigation from three different perspectives. The fourth book of this series is due to be released on June 30. Val McDermid’s Kate Brannigan. Most of Ms McDermid’s books are not cozy, but this (Too short!!) series is. P.N. Elrod’s Jack Fleming Mysteries (The first seven-book story arc, anyway. After that they start to get dark and weird) are definitely cozy. Jack is a PI in 1930’s Chicago. I highly recommend them. Btw, Conrad Allen’s series is technically, the Dillman and Masefield series. Genevieve Masefield is a full partner with George Porter Dillman. Both of them are PI’s, and share main character status in the series. Susan *, also, thank you for letting me know if they’re Cozy or not. I believe Waverly Curtis their series The Barking Detective Agency. I believe Geri becomes a private detective. Not sure been awhile since I read Dial C For Chihuahua. Julie, this is a perfect example of me forgetting to add a series when I added the author’s page to the site. Thank you! Yikes! I should have said Cozy Private Investigator Sleuths in the entry! If you’re suggesting a mystery author/series that you believe isn’t Cozy, please let me know and I’ll mark it that way. Thanks! What about The Lola Cruz Mystery series by Misa Ramirez? KG, perfect! I just added her to the list. Thanks! How about Lindsay Davis? Falco describes himself as a PI. Sheila UK, thank you. I’ll go add her series to the list. Lorena McCourtney’s series featuring Assistant Private Investigator Cate Kinkaid is always good fun! Does anyone recall an older, less-cozy series of 2 or 3 books with a former homeless young woman opening a private detective office in an old downtown building? Have been puzzling over this for several years and it is driving me crazy! Would like to reread the series. She was a tough, independent loner-type. I believe she rode a bike when she wasn’t borrowing her friend’s car for stakeouts and visited Goodwill for clothing disguises. I remember one particular book she was pursued along beach and boardwalk and through an abandoned hotel.